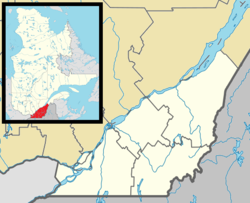 Saint-Isidore is a parish municipality in Roussillon Regional County Municipality in the Montérégie administrative region of Quebec, Canada. The population as of the Canada 2011 Census was 2,581. It is the hometown of mixed martial arts champion Georges St-Pierre. ^ a b c "2011 Community Profiles". 2011 Canadian Census. Statistics Canada. July 5, 2013. Retrieved 2014-02-16. ^ "2006 Community Profiles". 2006 Canadian Census. Statistics Canada. March 30, 2011. Retrieved 2014-02-16. This Quebec location article is a stub. You can help Wikipedia by expanding it. This page was last edited on 27 August 2018, at 16:48 (UTC).